Gupp-E has gotten a significant upgrade -- move-able eyes! Gupp-E will be available soon as a downloadable PDF and as a pre-cut kit set, both for sale at my online webbe shoppe. An incredible new creature from the Netroids Universe! 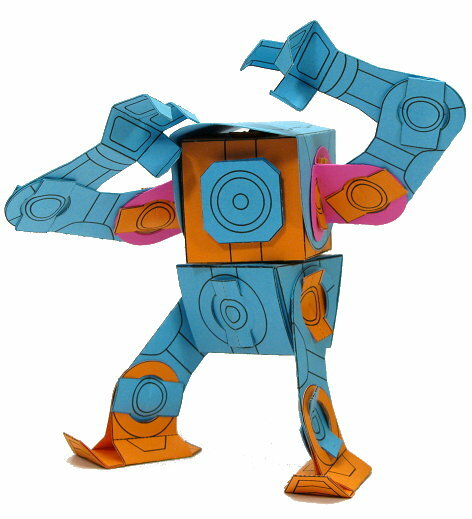 Drago is a beast of a paper Poplock toy with massive amounts of pose-ability and play-ability! Check out some more great poses on jimbox31's Netroids Universe site and download your own copy of Drago! Gupp-E is getting a re-release reboot! My first Poplock Toy, Gupp-E is now crammed onto 2 pieces of card stock, has more move-able parts and is easier to make. More pics and info coming soon! This is the biggest Poplocks toy yet released, CMP-S (Compass), the adventurer robot! A little over 8.5 inches tall! Made with parts from 4 pages of card stock. Extra poseable and full of emotive quality. Click "Read More" below to download and learn how to build your own E-MOS CMP-S! James Fritzler has, in a surprisingly short amount of time, created his own universe - the Netroid Universe! 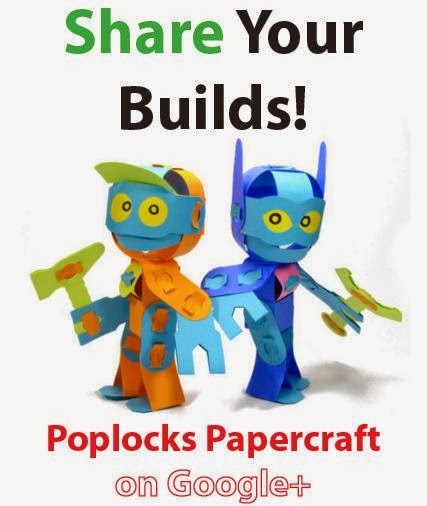 Download and make your own fantastic creatures to print, cut out, and assemble using Poplocks. In addition to making Poplocks do things I haven't seen before, Netroids are full of new techniques for glue-lessly joining paper. Check out the waist connection on Stall and Stego for instance! Go visit the Netroid Universe and start building your own piece of it! James Fritzler AKA jimbox31, has crafted another fine paper dino! You can download and build your own Stego paper toy, maybe to start populating your own Jurassic Dinoland. Stego features a novel use of paper strips to create a unique "belt" for adding a swivel motion to Stego's hips. Building and playing with this brought me engineering joy! 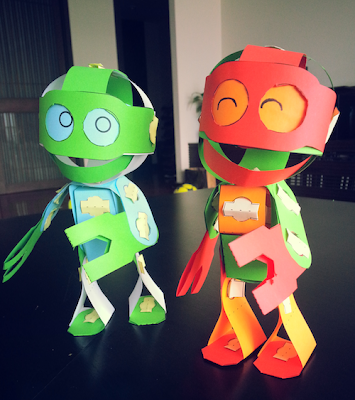 James is creating a great line-up of paper toys, and is quickly building up the members in his newly minted "Netroids" brand. Just wait and see what's next! "My lines are colored in - can you customize me also?" Stego and Raptor circle each other, trying to determine who is the most gnarly.